Overby Farm Hip Flex Tabs - Level 3 Joint Care with Tart Cherries is formulated to provide dogs in need of advanced joint care such as senior pets and those recovering from joint related surgery. 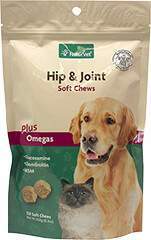 Contains Glucosamine, MSM, Chondroitin and Hyaluronic Acid for added joint support. Formulated specifically for Senior Dogs with Time Release formula. Helps alleviate aches and discomfort. Supports joint health and function. We're pet lovers, too! That is why we created Glucosamine Plus for Dogs & Cats — a unique blend of Glucosamine Sulfate, Shark Cartilage and Sea Cucumber — the same popular ingredients found in many people products. Glucosamine is the primary component that keeps connective tissue and bone together. ** Sea Cucumber and Shark Cartilage are both excellent sources of a host of minerals and protein. For animals ranging in weight from 5-25 pounds, give one (1) capsule daily. For animals ranging in weight from 26-50 pounds, give two (2) capsules daily. For animals over 50 pounds, give three (3) capsules daily. Every Pet Naturals™ supplement is naturally formulated with the most pure and potent ingredients available. 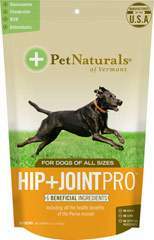 Contains Glucosamine, Perna, MSM and Antioxidants all ingredients that may help support joint health and mobility.